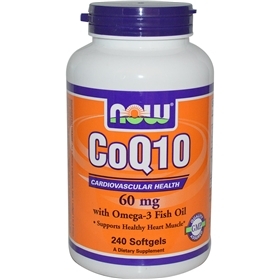 Coenzyme Q10 is a vitamin-like compound also called ubiquinone. It is an essential component of cells and is necessary for mitochondrial energy production. Years of research has shown that CoQ10 supports healthy cardiovascular and immune system functions in addition to its vital role in energy production. NOW uses only the 100% natural, all-trans form of CoQ10. The natural fish oil concentrate used in this softgel is tested to be free of potentially harmful levels of contaminants (i.e. mercury, heavy metals, PCB's, dioxins and other contaminants).